A few months ago we traveled to the great state of Colorado, and while we didn’t Panclog while we were there, we did set up some pretty tasty stakes. On March 7th, we went to the Denver Nuggets vs. Los Angeles Lakers game at the Pepsi Center. 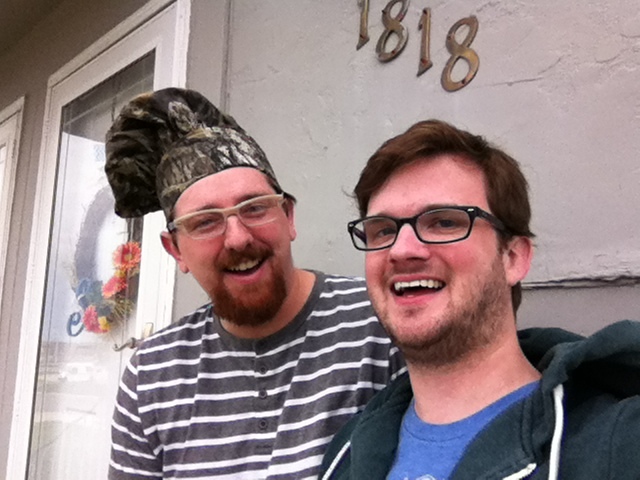 On a whim, we decided to make a bet. If the Lakers won, Stephen would make breakfast for Jared. If the Nuggets won, Jared would make breakfast for Stephen. It’s pretty simple. The Nuggets ended up winning 134-126. Last week, the bet was settled. Location/Environment: I’m pretty accustomed to the Sova residence, as I spend a lot of R&R time over yonder. It’s cozy and warm — you really get the vibe that this home was styled with breakfast in mind. Menu/Selection: Jared would have made me anything I wanted. Jared knows that my favorite breakfast item is French toast, so I expected something along those lines. However, the dish served was far beyond anything I could have imagined. 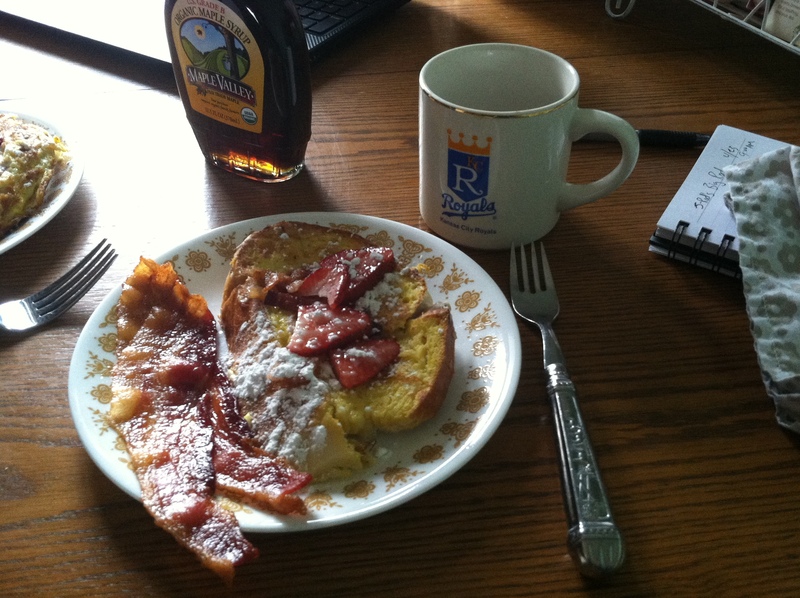 He also managed to incorporate my favorite side, bacon, into the French toast, as well as having bacon on the side! There’s a lot to dissect here, so let’s start with the actual bread. Perfect creamy, soft bread, so easy to cut with a fork. I’ve said it many times, I’ll say it again: Italian bread works very well for French toast. I assume this is because France and Italy actually touch. Let’s talk about the filling. Rich, cream cheese filling with bits of bacon hanging out. Perfection. The bacon is a very subtle addition to the sweet creamy filling, but it’s effective in its presence. The filling itself was similar to stuffed cream cheese I’ve had before, but the taste and consistency was far superior. You could tell it was homemade, and that made the difference. Let me tell you my side of the story… I was very upset that my favorite NBA team lost to the Javale McGee-less Nuggets. But this loss has pushed me to step back into the kitchen for the first time since the Tuna Croquette failure of 2012. So after many minutes of pouting, I decided to get to work. I have always known that Stephen loves to indulge in some French Toast now and again. This led me to create a dish especially for him. I invented a delicious stuffed French toast with a twist. I started with fresh baked Italian bread. I mixed cream cheese with diced bacon. I then added some Maple Bourbon. This is my own special twist. I added enough that you can taste but not so much that it would ruin the dish. Because bacon and bourbon are both savory flavors, I added sliced strawberries to the top. This lightened up the whole flavor profile. With some powdered sugar on top, this dish was ready for devouring. I made extra bacon, because really who doesn’t want bacon on the side? I bought organic 100% pure maple syrup just for this occasion. I have recently discovered the vast taste difference between real maple syrup and the fake stuff. I am a big fan of real maple syrup. Overall: Topped with fresh strawberries, powdered sugar, and maple syrup, this French toast was in the upper echelon of French toasts I’ve ever had. Sure, I’m biased since Jared is my fellow ‘clogger, but he knocked it out of the park. One piece was all you needed. Rich and savory, yet filling enough to be a solid breakfast with a few pieces of bacon and a cup of coffee. Price: I would have paid upwards of tens of dollars for this meal.